2007 Husqvarna CR125. Picture credits - Husqvarna. Submit more pictures. Husqvarna CR 125 remains the reference point in the Motocross world with its world titles palmares and numerous national titles. It does not feel the passing of the year and it�s still competitive even between the four stroke models. 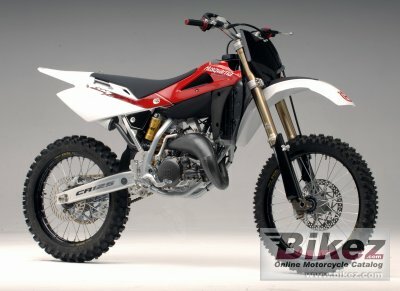 Modifications compared to previous model: For the 2007 version of this bike, the Husqvarna R and D department gave particular attention to empower the model: the crankshaft and combustion chamber have been modified to reduce engine inertia and increase rideability. The gear presents a shortened second gear ratio to help perform better starts. The exhaust system was changed and the new V Force 3 reed valve has been mounted to increase power. Ask questions Join the 07 Husqvarna CR125 discussion group or the general Husqvarna discussion group. Get a list of related motorbikes before you buy this Husqvarna. Inspect technical data. Look at photos. Read the riders' comments at the bike's discussion group. And check out the bike's reliability, repair costs, etc. Show any 2007 Husqvarna CR125 for sale on our Bikez.biz Motorcycle Classifieds. You can also sign up for e-mail notification when such bikes are advertised in the future. And advertise your old MC for sale. Our efficient ads are free. You are also welcome to read and submit motorcycle reviews.